Trees absorb carbon and make clouds. 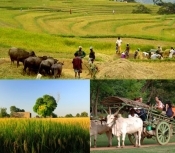 They also help restore ecosystems by reducing erosion, balancing the water cycle and stopping desertification. 90 % of known terrestrial species live in forests, making them the most important repository of terrestrial biodiversity. Plant a tree with green Tree Eco Team Build up a friend ship Inviting Nature into our Lives ! 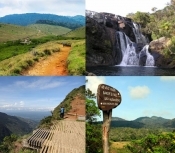 Nature walk in Horton Plains National Park, which is approximately 10,000 Hectares in extent, is haunted by Elk, Deer, Giant Squirrel, Wild Boar, Wild Hare , Porcupine, and a variety of Migratory birds, unique to this region. Camping is nature’s way of promoting the motel business, once I’ve heard it said. 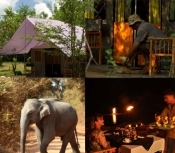 Hence, if you are looking for a nice, sylvan ‘nature’s motel’ under the starry sky, the Big Game Camps will be your answer! 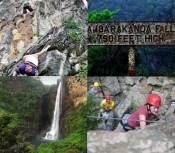 Bambarakanda waterfall is the highest waterfall in Sri Lanka and at present there is 1 professional and 2 beginner's climbing paths at this beautiful 790 ft high waterfall. 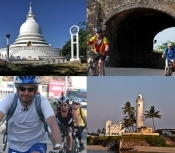 In recent times there has been a substantial increase in the concept of Agro tourism, the world over, with Sri Lanka being no exception to same. 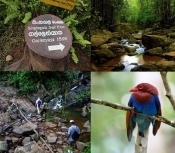 Start the jungle / village trail to Thalkote Wewa. [Tank] This is about 5.2km long and takes about 3 hours. This trail is going through few jungle patches / chaina cultivations, paddy fields. The terrain is flat and easy walking. Fishing is sacred ritual for a sizeable chunk of the male population. 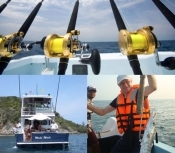 The lure of escaping the daily grind and catching the mystical “fish of a life time” keeps anglers coming back for more. This is a climatically transitional area, which links the dry and wet zones at an altitude of less than 1500m. 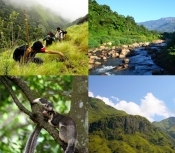 As a result, the vegetation it consists is moist semi-evergreen forests, tropical savanna forests, dry patana grasslands and montane temperate forests. The vegetation in this environment has made this location an exciting one for the serious as well as the casual nature lover. 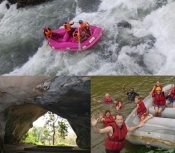 This thrilling adventure on the white water sections of the Kelani River is suitable for amateurs as well as professionals alike. During the river run you will experience the thrill of shooting rapids and the euphoria of making it through. 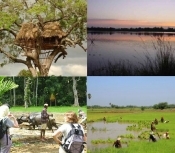 Dambana is a remote jungle village, where the original indigenous people of Sri Lanka still reside. The Veddhas preserve a direct line of descent from the island's original Neolithic community dating back from at least 18,000 BC. 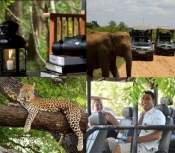 Mahoora mobile tented safari camps are the ultimate in safari camping with the ultimate in comfort and style. 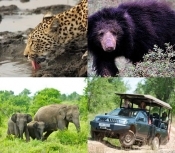 Just sit back and relax, and let us take you on a Sri Lankan wildlife tours experience that you'll never forget.